Chadwick moves the talk about concentric parallelism (chiasm) in biblical prose out of academia and into the pastor's study. The author displaces ""reasons why we shouldn't"" with ways we can confirm and interpret large concentric structures in scripture. 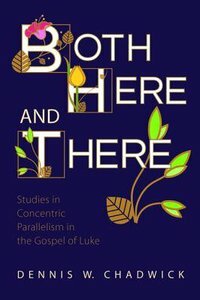 Chadwick methodically unpacks the Galilee-to-Jerusalem travel narrative in Luke and brings to light three other lengthy concentric structures in the Third Gospel. He helps pastor-exegetes apply a productive hermeneutic that can lead to theologically rich preaching and teaching from Luke's Gospel. Any experienced Bible student will find Both Here and There fresh and fruitful. ""Every child who ever treasured hearing the 'Hickory, Dickory, Dock' story of that mouse who ran up the clock intuitively knows why parallelism makes a story memorable. Chadwick's Both Here and There makes Luke's clear and compelling use of artistic parallelism just as accessible for the twenty-first century reader, reminding us how learning that 'the clock struck one' once created this same need to hear the resolution of the story in all of us."" --Robert Stephen Reid, author of Preaching Mark (1999) and editor of Slow of Speech and Unclean Lips (Cascade, 2010) Dennis W. Chadwick is a former church planting pastor and is now retired from Inter-Varsity Christian Fellowship, having pastored graduate students and faculty at the University of Kansas. He and his wife live in Lawrence, Kansas. About "Both Here and There"